“O Cross – guardian of the universe; O Cross – adornment of the Church; O Cross – support of the faithful; O Cross – the glory of angels and the defeat of demons.” With these and similar words the Church glorifies in its hymns the venerable and life-giving Cross of Christ, which lies before us and the feast of whose exaltation we are now celebrating. However, these words of the Church hymns not only represent spiritual poetry, but have actual meaning. Let us ponder, dear brethren, why the Cross is called the glory of angels and the defeat of demons. Mankind was created in order to fill in the gap in that circle of higher beings, which was disrupted by the fallen angels who had followed Satan. The bright angels, who remained with their Creator, are our elder brothers and infinitely love us as possible participants in the Heavenly Kingdom. The demons passionately hate us for that very same reason, and envy our chance to experience the eternal bliss of which they have been deprived forever. The angels and the demons battle constantly for our souls, and on this field of battle the major weapon is the Cross, which brings a glorious victory to the angels and a bitter defeat to the demons. The Cross symbolizes the sacrifice that our Lord Jesus Christ made for the salvation of mankind and for its deliverance from the torment of the devil. Gazing upon the Cross, the faithful can become confirmed in their faith and fortified in their battle with the demons, as they struggle to attain salvation. The angels rejoice in seeing the strength which the Cross confers upon the faithful, while the demons bitterly weep as they lose their prey, due to the aid given to the faithful by the Cross. The most wondrous example of how the angels glory in the Cross, while the demons are vanquished by it, are the holy martyrs. These noble warriors of Christ, following the example of their Lord Jesus Christ, and fortified by the power of the Cross, fearlessly suffered torture and attained crowns in the Heavenly Kingdom. The salvation of such a multitude of souls, particularly the great hosts of New Martyrs, brought a resounding defeat to the demons in their attempt to destroy mankind. And today we see before us an extraordinary example of the victory of the Cross over the demons. Today we commemorate the wondrous saints, the three young martyrs Faith, Hope, and Charity, and their mother Sophia, – who deeply wounded the demons. 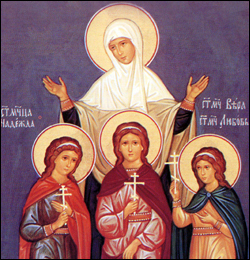 These holy martyrs are truly amazing: three young girls (the oldest – Faith – was 14, while the youngest – Charity – was only 9 year old), and yet these delicate and fragile maidens courageously endured the cruelest torture for the sake of Christ and put to shame the Roman Emperor himself, while their mother, suffering cruel inner torment and anguish, against her own maternal nature encouraged and inspired her beloved daughters to endure martyrdom. These holy martyrs, however, not only represent a wondrous example of drawing strength from the Cross, but also have a deep symbolic meaning in the Christian Church. The maidens bear the names of the three greatest Christian virtues – faith, hope, and charity (love) – and are born of their mother Sophia, whose name means “wisdom.” Therein lies the depth of meaning: it is precisely spiritual wisdom which gives birth to these virtues in us, nurtures them in us and helps us bear spiritual fruit from them. And the way all of this actually takes place in life can be seen in today’s Gospel reading. Today we see before us the woman of Canaan, who seeks help for her tormented daughter. The woman of Canaan turns out to be wise enough to understand that help can be received only through special, even supernatural, means. And in trying to obtain this help, this simple woman exhibits the three virtues of faith, hope and love. She has faith in that the Lord can help her with a single word; she has absolute hope that He will take pity on her, even despite His seeming indifference to her plight; and she has such great love for her daughter, that she is ready to humble herself, to endure all possible humiliation, all possible insult, in order to get her wish. And we see the fruit of her wisdom and her virtuousness: “O woman, great is thy faith: be it unto thee even as thou wishest,” – says Christ the Saviour to her. Dear brethren! Let us exhibit these three virtues – faith, hope, and love – towards God, towards our Lord Jesus Christ, and towards our neighbors; let us follow the wondrous example of the holy martyrs Faith, Hope, Charity, and Sophia, who did not hesitate to give up for God’s sake all their earthly gifts – youth, health, wealth, family affection; let us appreciate with all our heart Christ’s sacrifice on the Cross, which was made for our own salvation; and let us build our lives upon the Cross of Christ, so that through us, too, the angels would be glorified and the demons defeated. Amen.